Alvin's Ensign Drafting Table is a practical, convenient, and functional addition to your studio. It is adjustable in pitch or height with the manipulation of an easy-to-use, extendible lever. 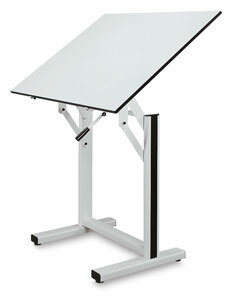 The white Melamine® top adjusts from 0° to 90°, and the height of the board adjusts from 35" to 47". Traction springs help to regulate balance and adjustments. A double pedestal base made of heavy-gauge steel keeps everything stable. The base is available in white or black finishes. Assembly is required.